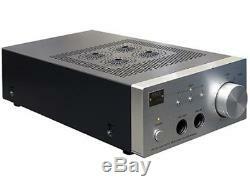 STAX SRM-007tA Vacuum Tube Driver Unit AC 100V. Fully balanced system from input to output. Circuit configuration is traditional all stage direct connection balanced A class DC amplifier. Two output 6FQ7 / 6 CG7 of the high-voltage dual triode tube are mounted on the output stage, and the driving force is increased. Frequency response DC 100 kHz / + 0, -3 dB (when using SR-007 × 1 unit). Harmonic Distortion Ratio 0.01% or Less / 1 kHz 100 V r. (When Using One SR-007 ×). Amplification degree 54 dB (500 times). Rated input level 200 mV / 100 V r. Maximum output voltage 340 V r. Input impedance 50 k (RCA), 100 k (XLR). Input terminal XLR × 1, RCA × 2 (parallel out terminal). Bias voltage 580 V DC. Power supply voltage AC 100V, (50/60Hz). Use vacuum tube 6FQ7 / 6CG7 2 each. External dimensions 195 (W) × 103 (H) × 420 (D) mm (excluding protrusions). Note: This unit is a Japan Model (You will need a voltage Step-Down Transformer). The optimum source for your online shopping experience direct from Japan. We are pleased to provide you the authentic quality products direct from Japan at an affordable price. We are updating new items on a daily basis, so please come back often. If you don't see what you are looking for here today, you might see it tomorrow. If you have any questions, please feel free to ask us. We will reply to any inquiries to everyone as fast as we can, and all our staff will do our best for your satisfaction. Thank you for your patronage. We will reply to you as quickly as possible. (35 days to most countries) Tracking info with URL will be emailed to you. Once the package enters your country, you can also view the tracking result at the Post Office website in your country as soon as the status is updated. Here are some of the Post Office tracking links. The item "STAX SRM-007tA Vacuum Tube Driver Unit AC 100V from Japan NEW" is in sale since Friday, September 21, 2018. This item is in the category "Consumer Electronics\Portable Audio & Headphones\Headphone Parts & Accessories". The seller is "melon21store" and is located in Tokyo. This item can be shipped to North, South, or Latin America, all countries in Europe, all countries in continental Asia, Australia.